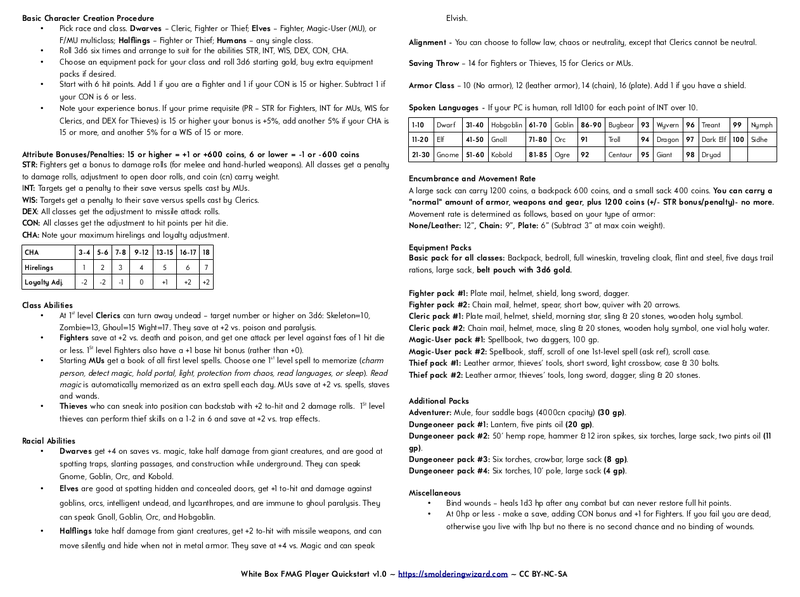 I’ve put together a White Box FMAG player quickstart, designed to help speed up character creation while referencing just one page. In my experience the most tedious part of creating characters is buying equipment, so you’ll see some pre-built equipment packs – a standard one that all characters start with, and choice of two packs per class. The packs are designed to offer a trade-off, for example you can pick a well-armored Fighter, or trade the best armor and sword for a spear and missile weapon. Magic-Users can choose to start play with 100gp or have a spell scroll instead. You can allow players to swap out similar weapons to add variety. The next biggest time sink is tracking armor and weapon weight – so that is not done at all, instead I opt to allow characters to carry a maximum coin weight. With a nod to Holmes Basic, encourage players to keep a “reasonable” amount of equipment by writing down where their equipment is stored. You can do this painlessly by dividing up the equipment list, so for example one heading on a player’s character sheet is titled ‘Backpack’, under which they write, well, what is in their backpack. I have a google doc character sheet designed to go along with this. Just copy it into your own google drive and edit it to suit. It is very handy in online games, because you can enable link sharing and both the referee and player can edit the document together, in real time. Here is an example of a filled-in character sheet, Burgo the Dwarf Fighter. The core rules on the quickstart are largely ‘by the book’, as much as an OD&D clone like this can be, meaning that I’ve tried to stick to the options supplied in the White Box FMAG rule book. I have, however, added a rule for save vs. death at zero hit points, and a table to roll or choose extra languages. I also give 1st level fighters a +1 base hit bonus, to give them a slight edge in combat, and I assume ascending AC and a single save – both of which I believe are what gave Swords & Wizardry its unique feel when it first came out. That said, you can modify the document as you see fit, I’m providing a link to the PDF and original LibreOffice document. It’s licensed so you can tweak and re-distribute it for free, as long as you don’t sell it and leave the footer attribution and license in place. You’ll notice I left out some details like the explicit chance of Elves finding secret doors, or of non-humans hearing noise. That reflects the fact that the referee will be rolling those, not the player, so the details are not important. I am planning a referee quickstart that will have much more detail for things like this. Updated 3/30/19 to include OGL text. I like it! It is something I could use at the game table. The equipment packs are a great addition. Something I wonder, and my characters have done this, is in reference to fighter pack #2. How easy is it to carry a spear and bow? I’m always wonder how the spear travels when I am using the bow. Maybe a leather sling to strap the spear on your back? Thanks! Yeah I assume a small leather shoulder strap would work for the spear.